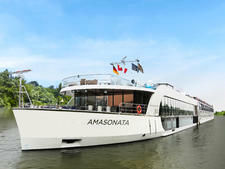 Launched in 2010, the 81-cabin AmaBella was one of the first of the Ama Concerto-class ships to debut a twin balcony concept -- a rarity in river cruising. A total of 52 generously proportioned cabins have a French balcony, with floor-to-ceiling windows that open out over a railing, plus a walk-out veranda with room for a table and two chairs. 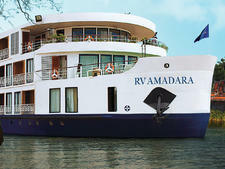 With windows covering most of the outside cabin wall, these staterooms are particularly light and airy. Other notable amenities include a splash pool on the sun deck, combined hairdressing salon and massage room and a small gym with a sauna. An open bar, daily excursions and all tips are among the high number of inclusions and -- depending on the package booked -- there are also private home-to-airport transfers and onboard butler service. 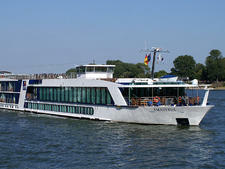 All crew members speak English and are very warm and friendly. As AmaBella carries less passengers than some other riverboats of the same size there are high levels of personal service -- by day two you can expect the bartender to remember your favourite drink. 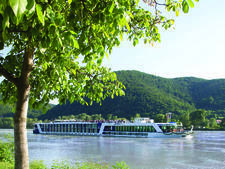 On the food front APT, through its link with AmaWaterways, is the only river cruise line that is a member of prestigious French gastronomic association La Chaine des Rotisseurs. 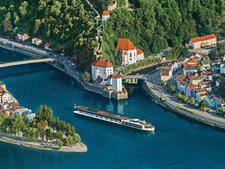 The standard of the food is excellent and on each cruise there is a La Chaine des Rotisseurs dinner. Another unique feature is that on certain nights the main restaurant is divided into two halves, with an Italian menu served on one side and an international menu served on the other. AmaBella also has a separate Chef's Table restaurant featuring a tasting menu, and all passengers get to eat here for free. 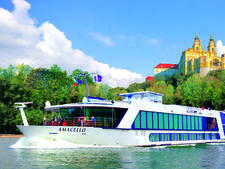 Since 2016 AmaBella, owned by AmaWaterways, has been exclusively chartered by Australian-owned partner company APT, which celebrated its milestone 90th anniversary in 2017. 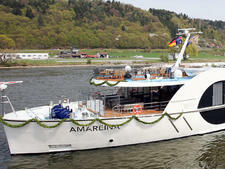 Some ships in the Ama fleet are operated by both of the family-run companies, while others are solely chartered for APT's "luxury" branded European programme. 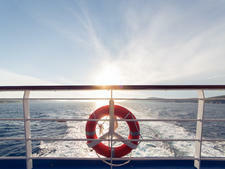 APT cruises are marketed in Australia, New Zealand and the U.K., and these countries make up the majority of passengers onboard. 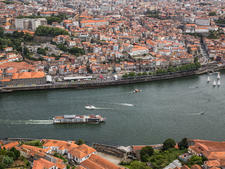 However, anyone can book an APT cruise so you may find a sprinkling of other nationalities, including passengers from the U.S. and other English-speaking countries. 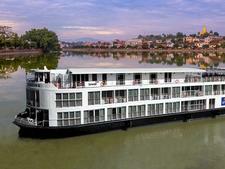 Unlike the majority of mainstream European river cruises, which generally average seven to 14 nights, APT offers much longer voyages, which take into account the long travel distance for its core Australian market. 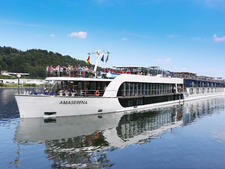 AmaBella sails exclusively on APT's Magnificent Europe cruises on the Rhine, Main and Danube. 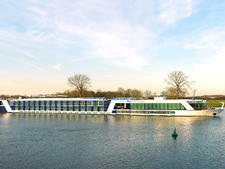 These start at 14 nights -- sailing from Amsterdam to Budapest or in reverse -- and extend to a 23-night journey taking in 23 destinations with land-based hotel stays in Berlin, Paris and Prague at the beginning and end of the trip. APT appeals to well-travelled passengers, mostly aged 50 and above and many of them retired with time to travel on the longer-than-average itineraries. However, there were people in their 40s and a few younger, on our cruise. Australians, who make up the majority of crew mates, tend to be a fun-loving crowd and the onboard atmosphere, especially in the evening, is livelier than you might get on vessels catering primarily to other nationalities. AmaBella mainly attracts couples, and there were some small groups of friends and one or two solo travellers. The dress code is "casual and comfortable" by day and "smart casual" for dinner. Passengers are not allowed to wear swimwear in the restaurant or lounges, and shorts are not suitable for dinner. There is one captain's night per cruise, which is when people tend to wear their best attire -- collared shirts and jackets for men (ties not required) and dresses or smart trousers and tops for ladies. The most important things to pack are comfortable shoes or trainers for the shore excursions as many of them involve walking along cobbled streets. The weather in Europe is also very changeable, even in summer, so it's a good idea bring layers, along with hats, sunglasses and a light raincoat. Umbrellas are provided onboard. AmaBella fares include an all-day open bar (with the exception of a small number of premium brands and Champagne) and you can even get sparkling wine at breakfast. Two wines, a white and red, are served with lunch and dinner. There is a complimentary 24-hour self-service tea and coffee station in the lounge and an ice machine is located at the entrance to the dining room. 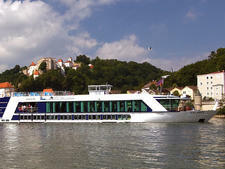 Bottles of water are placed in cabins and replenished daily and can also be collected from reception at the start of excursions. Some cabin categories include butler service, complimentary laundry and room service dining and -- in the top suites -- a bottle of Champagne on arrival. 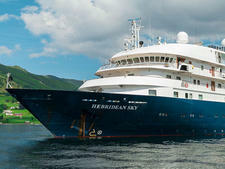 The ship carries a fleet of 24 complimentary bicycles, plus helmets, which are available on a first-come, first-served basis. 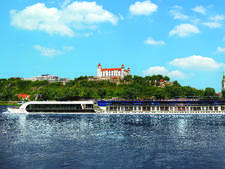 Complimentary Wi-Fi is available throughout the ship and during our cruise there was a very fast connection and, unusually for river cruises, few interruptions to the service or periods when it was unavailable. The onboard currency is the euro. 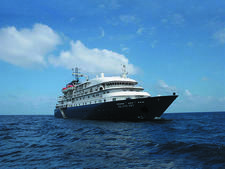 Gratuities to local guides, drivers, the ship's crew and cruise director are all included in the fare. APT is particularly noteworthy for thoughtful touches that go over and above other lines. Prior to the cruise we received a large rucksack, washing bag, personalised cruise itinerary and magnetic name tags. And although we've never had the misfortune before, one of our suitcases was mislaid by the airline. APT provided a complimentary emergency kit, one for a man and one for a woman, containing essentials such as toothbrush and toothpaste, deodorant, T-shirt, underwear, socks and a pair of tights. A very welcome touch.